When admiring authentic or reproduction Victorian fireplaces, we often overlook the fact that they played a dual role in households of the time. They were the sole source of heat as well as being the focal point of the room. 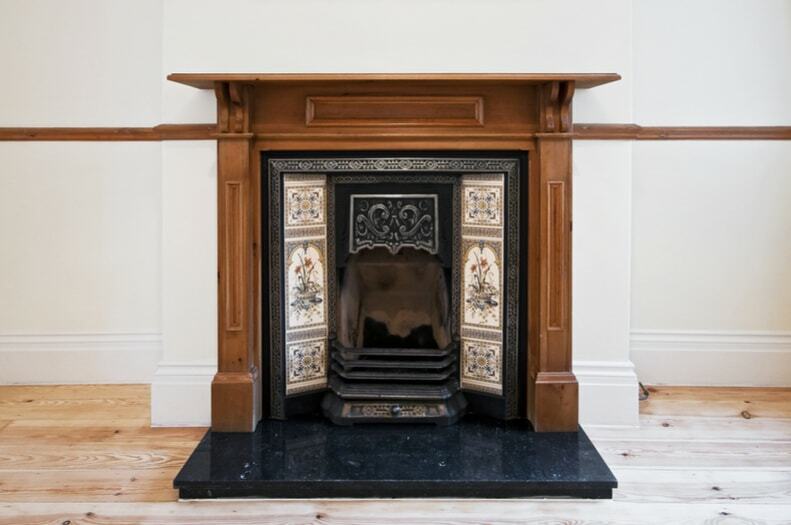 What is a Typical Victorian Fireplace? In retrospect, it is easy to oversimplify and talk about a ‘typical’ Victorian fireplace. The first thing to remember is these fireplaces varied according to the region, social class and the room where the fireplace was located. Rooms commonly seen by visitors such as the formal sitting room would have the most ornate decorations while bedrooms would have simpler cast iron models. Another point to bear in mind is that styles and fashions changed over the course of Queen Victoria’s 64-year reign. At the beginning, fireplaces were still constructed in the more classical Georgian and Regency styles. This was gradually replaced by more elaborate designs, often with floral motifs. Later in her reign, the style of fireplaces became simpler with more geometrical designs. Although the rise in simple geometrical shapes such as an arched insert looked aesthetically pleasing, this change had another function. It also allowed more heat to be generated and helped prevent smoke from escaping into the room. In the latter half of the period, hinged registers became increasingly popular. They gave some control over the fire’s air supply and could be closed to seal off the fireplace from the flue. The hearth was often angled to allow more heat to enter the room. The Victorian era coincided with the height of the Industrial Revolution when coal replaced wood as the main source of fuel. This had an impact on the style of grate typically found in Victorian homes. Grates would be set low on the hearth, and their narrow opening improved fuel efficiency. Built-in metal grates kept the coal in place so that andirons were purely used for decorative purposes. The Industrial Revolution also led to increased urbanisation and the large-scale construction of housing. Manufacturing methods made it cheaper than ever before to mass produce fireplaces for these homes. This led to standardisation in the sizes of fireplaces instead of relying on the judgement of the individual craftsman as happened before. It was much easier to make cast iron fireplaces or prefabricate marble surrounds (and reassemble them on site). If the working classes had simple cast iron fireplaces as the cheapest option, the affluent could choose more expensive materials. As the room’s focal point, Victorian fireplaces were also an opportunity to impress visitors with ornate designs, decorative glazed tiling and/or costly materials like marble and hardwoods. Those with less money were not above cheating. Slate could be painted to resemble marble while softwoods could be varnished to look more expensive. The surround (including the mantelpiece and side supports) were given even more prominence. The increase in the number and width of these shelves allowed householders to display more bric-a-brac, which was a characteristic of Victorian home décor. We owe a lot to the Victorian era – not only for changes in fireplace design but also for improvements in their functionality and manufacture.